Every morning there’s a bird singing right outside my window that wakes me up. Eventually I stopped thinking about it as a constant annoyance and decided to use it as inspiration for a new latte art design that has since become one of my favourites. 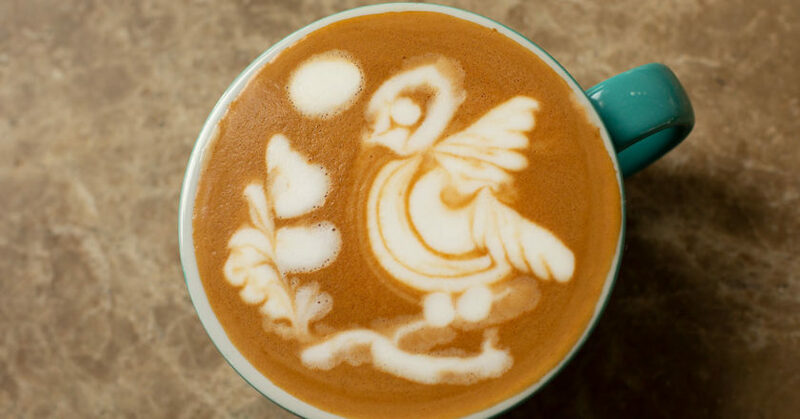 Bird patterns naturally lend themselves well to latte art designs, mainly because of the fluid free pour motion and detail you can create. Swans are common too, but when is the last time you saw a singing bird perched on a branch? In this pattern, it’s all about the little details that bring the bird to life. The best part is that once you master the technique, it’s a design you can produce in less than a minute – I’m setting you the challenge. 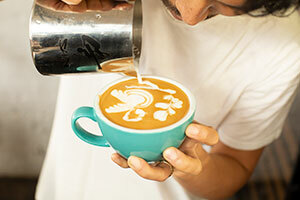 The good thing about this design is that it uses a combination of skills and staple latte art skills: tulips, rosettas, hearts, drags, and cup rotation. All you need to do is feel confident in each of those elements, then put them together. Nothing is perfect on the first attempt. This one took me months to be happy with. I kept searching for ways to make it realistic and as creative as possible, as evidenced by the landscape in this design, not just the bird. 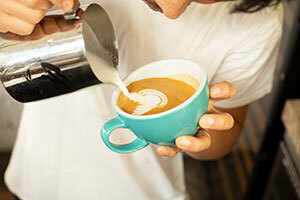 This was part of my focus in my recent World Latte Art Championship (WLAC) campaign. I went to Brazil hoping to become the new title Champion. I didn’t quite get there but I’m proud of placing fourth in the world. I couldn’t have done it without the support of St. Ali, my beautiful wife and coach Momo, the support of Riverina Fresh, Sanremo, and the ASCA World Judges. Competing in the WLAC was a dream come true. 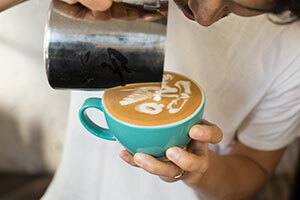 I went there to share my love for latte art and my passion for customer service and I’m thrilled that my patterns did what they were designed to do – make people happy. Position your handle at 3 o’clock and build your base. 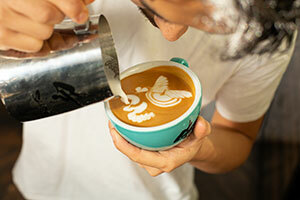 Pour three tulips into the centre of the cup to form the body of the bird, pushing one layer into the next. 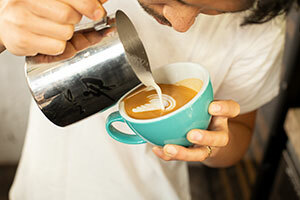 Pour again like you’re about to make another tulip layer, but instead, pour a four-leaf rosetta down the side of the cup, using a wiggle movement. Pull up on the right side of the rosetta to create the first wing. Rotate the cup slightly anti-clockwise. From the centre of the first tulip, pour another four-leaf rosetta down the cup and pull up along the right hand side of the rosetta. Rotating the cup clockwise so that the handle is now back at 3 o’clock. 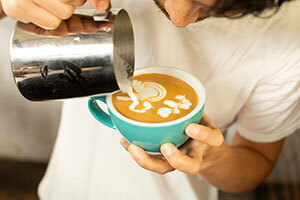 Aim your pitcher at the centre of the cup and pour a small heart or tulip to form the beak. Rotate the cup clockwise so that the handle is at 6 o’clock. 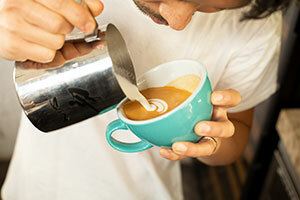 To make a tree, pour a five-leaf rosetta down the right hand side of the cup. 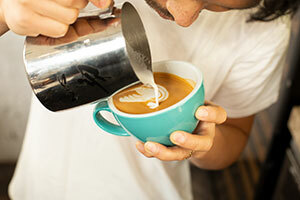 Continuing without break, drag the pour and create two reverse C shapes. Pull up through the centre. Rotate the cup handle back to 3 o’clock. At the back of the heart, draw another C shape to form a head and connect the beak to the body of the bird. On the left side of the cup, under the bird, drag your pour down the cup in a straight line to create the tree branch. Pour another small straight line from the larger one to form a branch. Aim your pitcher a little higher so that the milk stream is a little thinner and pour a dot in the centre of the head to make an eye, two small dots for the bird’s feet, and one larger dot above the tree to make a sun.